Rajya Sabha on 10th August has passed the Banking Regulation (Amendment) Bill, 2017 with the Rajya Sabha approving it. The Lok Sabha has already passed it. 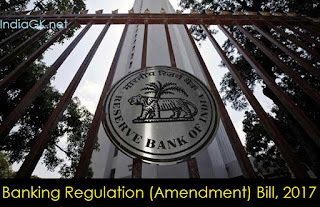 Bill basically empowers the Reserve Bank of India (RBI) to give directions to banks to act against loan defaulters. The Bill seeks to amend the Banking Regulation Act, 1949 by inserting provisions for handling cases related to stressed assets. Stressed assets are loans on which the borrower has defaulted or it has been restructured. RBI had, in June, identified 12 'defaulters' who account for around 25% of India's non-performing assets (NPA) and informed banks to take up insolvency proceedings against them. The Central Government can authorise the RBI to issue directions to banks for initiating proceedings in case of a default in loan repayment. These proceedings would be under the Insolvency and Bankruptcy Code, 2016. RBI may also form committees to advise banks on the resolution of stressed assets. The members will be appointed or approved by the RBI.